To be honest, I am on the fence with this 24H shopper. On the one hand, it is a classic Tod's bag, but there is really nothing to write home about. It is great if a gal just wants a plain simple leather tote to hull her things around town. It is tote that will pass the test of time because the silhouette is so simple. 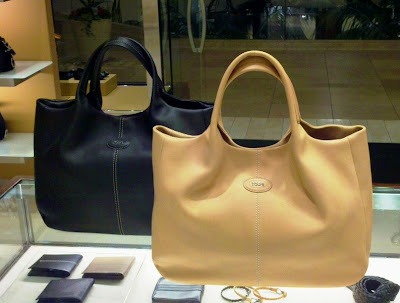 However, it is just like many other classic totes by "many" other designers. This time around, I think I will just pass on this bag because I have enough totes to last me a long long time. What do you think? Well I think if you want something that is going to last a long time - this may be the way to go, it's simple and isn't too bold so will last the seasons. But you should really love something if you're paying good money for it! The black one is nice, but you're right....pretty generic as far as bags go. It's cute and classic. Go with the black...it's an investment piece! Well, thank you for this interesting post ! as you can imagine, I'm more than deep into bags, bags, bags..... Would I ever buy or make a bag like that? Sorry, a resounding NO !!! It's classic but not unique. Splurge on something else. I think it's nice. Probably wouldn't spend the money, but it's nice. Eh, I bet you can find something that looks just like it for less. LOL.... one of my friends really loved the bag. I would buy it if I don't have so many classic totes already. Pass. It's not interesting enough...just meh. I'm not in love...considering how expensive it probably is! I really like it, but agree with you that if you have a few like it, it's not a must. Which means you can get something else fun!! Too dull for my taste, if you've already got totes that fit the bill. I really like the tan one, the black I find to be overly simplistic. However, one only needs one plain tote, so if you already have something similar, then I would pass. not a huge fan, but check out the classic tod's d bag - I absolutely love mine and it's so versatile!